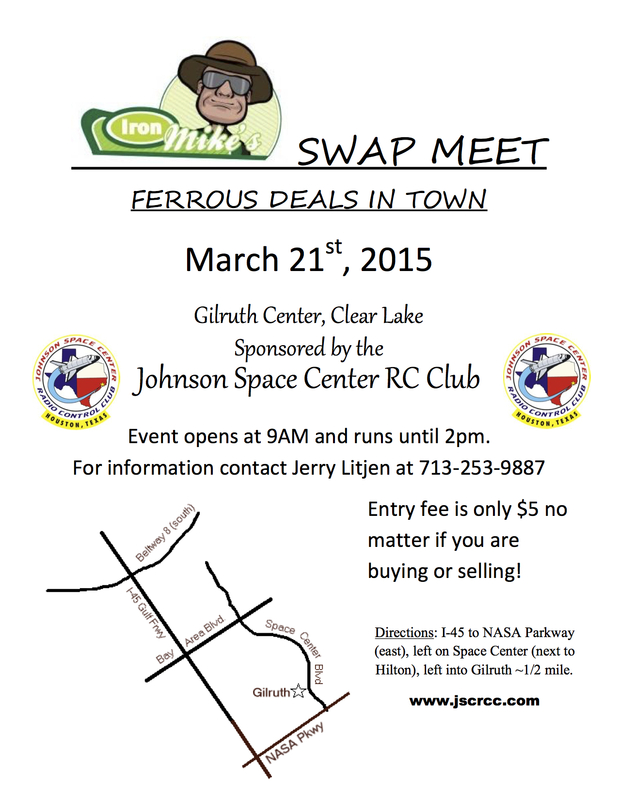 March 31st – Alvin Jumbo Squadron Fly-In and Swap Meet. 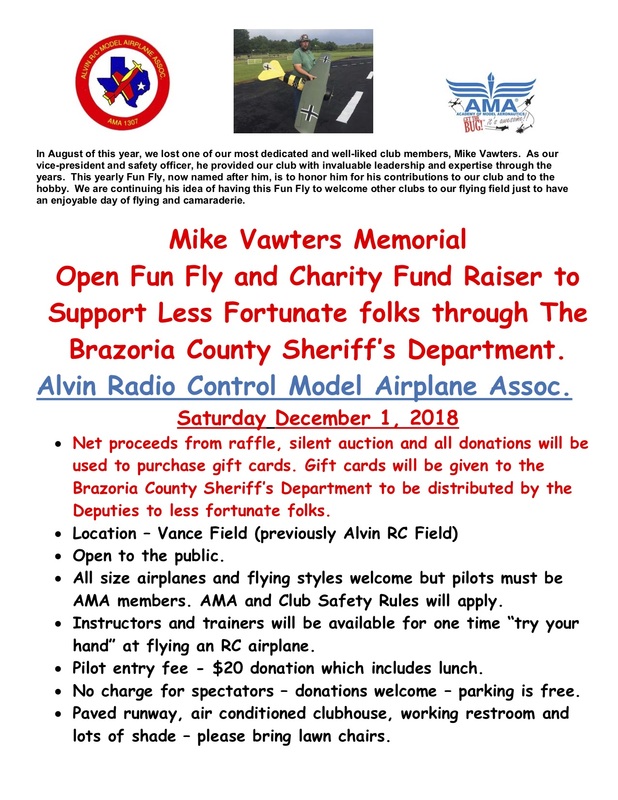 November – 2nd – Fun Fly to Support Less Fortunate folks through the Brazoria County Sheriff’s Department. Do not forget to come out October 14 to help with the Boy Scout event. Let’s help make sure they all get the merit badge. 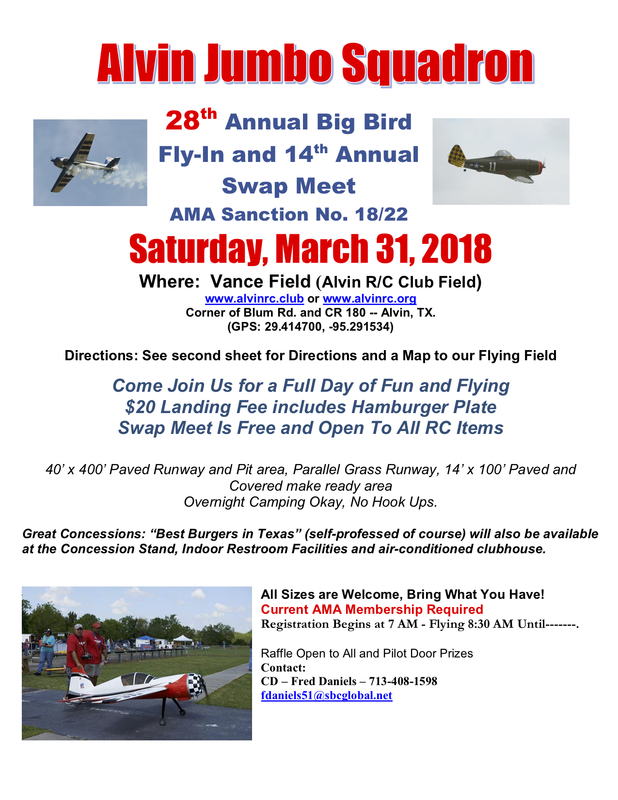 April 15 – 27th Annual Big Bird Fly-in and 13th Annual Swap Meet. 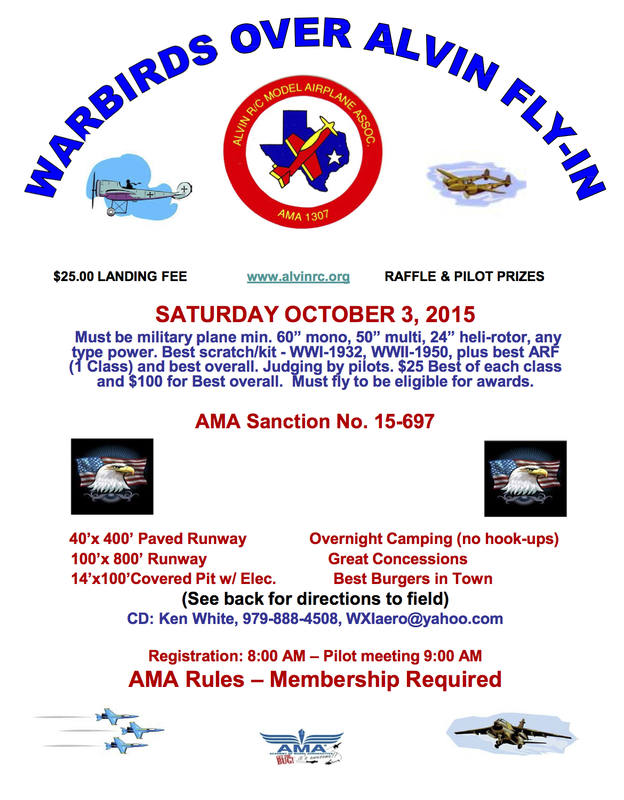 All size airplanes and flying styles welcome but pilots must beAMA members. AMA and Club Safety Rules will apply. Instructors and trainers will be available for one time “try yourhand” at flying an RC airplane. Computer simulator available in Air-conditioned clubhouse. Pilot entry fee – $20 donation which includes lunch. Spectators welcome – parking is free. Paved runway, air conditioned clubhouse, working restroom andlots of shade – please bring lawn chairs. Pilot registration begins at 7:30AM, Pilot’s meeting at 8:30 AM. Raffle prizes include two model airplanes. www.alvinrc.club or contact Mike Vawters at 409-770-3458. 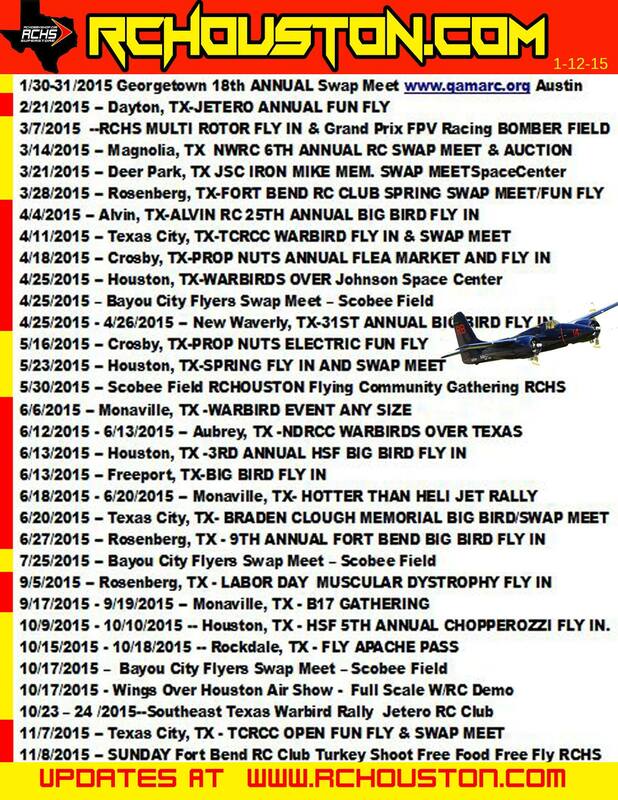 July 16 – 26th Annual Big Bird Fly-in and 12th Annual Swap Meet. 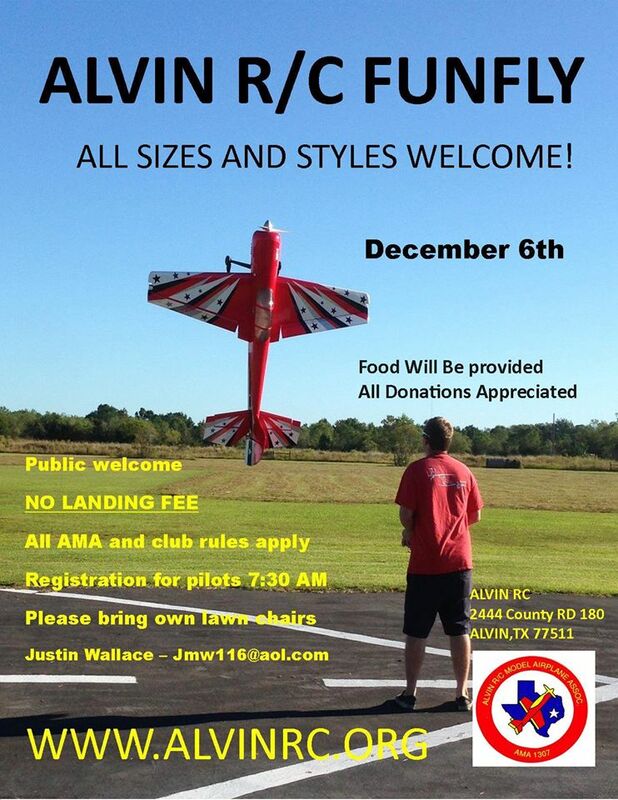 At our Alvin R/C Club Field corner of Blum road and CR 180. Registration at 7:30 and flying at 8:30 till ……… Raffle and Pilot prizes. Twenty dollar landing fee that includes lunch. Swap meet is free. 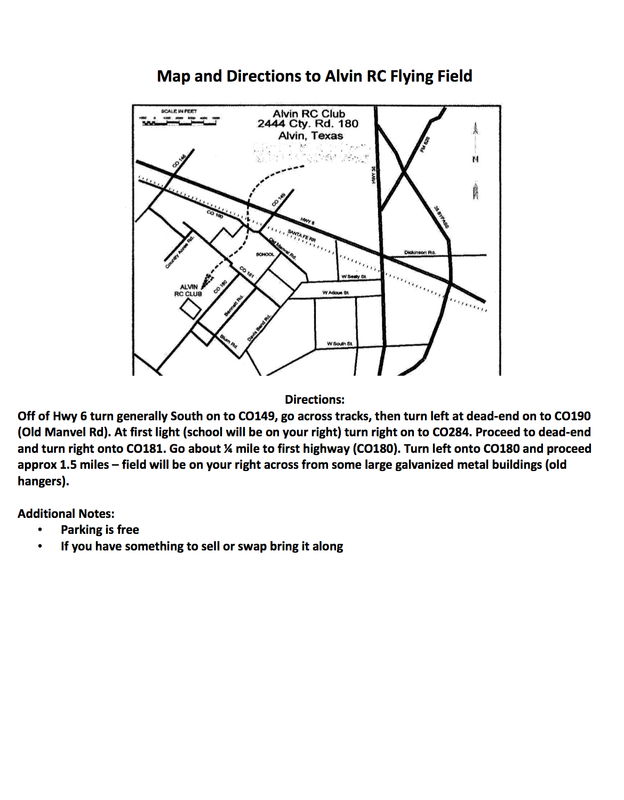 October 3 – Warbirds over Alvin – this will be an open AMA sanctioned event. Ken White CD PH: 281/331-7724 Email: wxiaero@yahoo.com. Visit: alvinrc.club. 15/697. Must be military min 60′ mono, 50′ multi, 24″ heli-rotor any type power. Best scratch/kit WWI-1932, WWII-1950, post 1950, Best ARF (1 class) & Best Overall. Judging by pilots $25 best of each class and $100 for Best overall. Landing fee $25 (w/lunch) Raffle. Sponsor: ALVIN RC MODELERS ASSN. June 27 – Monthly Meeting. Meeting starts at 9:00 AM. As always we will start serving breakfast at 7:00 AM. Come over to the field and have breakfast, fly, and visit with all your friends. June 13 – ARCMAA will hold an all-day fun fly celebration of the 40th anniversary of the club. Tom Stancliff will be barbequing the meat and all attendees are asked to bring a covered dish. The event will be limited to members and their families, prior officers and other direct invitees. Events will include a balloon bust, cutting of toilet paper streamers dropped from an airplane, candy drop (for the kids guys). Phil Vance and the planning committee are also putting together a pictorial history of the club. This should be a fun event and additional information will be forthcoming. March 28 – Monthly Meeting. Meeting starts at 9:00 AM. As always we will start serving breakfast at 7:00 AM. Come over to the field and have breakfast, fly, and see all your friends. February 28 – Monthly Meeting. Meeting starts at 9:00 AM. As always we will start serving breakfast at 7:00 AM. Come over to the field and have breakfast, fly, and see all your friends. January 24 – is our first meeting of 2015. Meeting starts at 9:00 AM. As always we will start serving breakfast at 7:00 AM. Come over to the field and have breakfast, fly, and see all your friends. There will not be a General Membership Meeting in January. Happy Holidays and see you January 24. November 22 – General Membership Meeting, Breakfast 7:00 AM, meeting 9:00 AM. Guests welcome. October 25 – General Membership Meeting, Breakfast 7:00 AM, meeting 9:00 AM. Guests welcome.